On this page, you will find the current laws for the use of drones in Ecuador. “If the person uses a drone as working equipment, they must prove that the equipment is also intended for it. Therefore this person has to carry a document with him, which shows which activities are planned. If the photographer is a photographer, he/she must have proof of qualification or a copy of the diploma indicating that he/she is dedicated to the profession. It should be emphasized that the drone must leave the country as soon as the work is completed. If the person does not wish to use the drone for professional purposes, the drone will not be exempt from duty, and the taxation will have to be continued. Maximum Altitude: In Ecuador, you can fly 120 meters (400 feet) with a drone. Maximum horizontal distance and FPV: The operation of drones is allowed in Ecuador only within the direct visibility. Compulsory insurance: In Ecuador you are obliged to buy drone insurance. Maximum take-off weight (MTOW): Not known. Distance to airports: At airports, drones in Ecuador should be at a distance of 9 kilometers (5 miles). Flight bans: On the Galapagos Islands there is a strict drone ban. Operating times: In Ecuador, multicopters may only be used between sunrise and sunset. Special regulations: Automatic maneuvers may only be used if you can intervene as a pilot at any time during the operation. Requirements for commercial pilots: We are not aware of any further regulations for professional drone users. 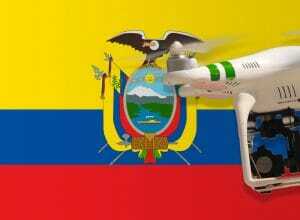 We have researched the listed drone regulations for Ecuador to the best of our knowledge. We cannot guarantee the correctness of the information. If you want to be on the safe side, contact the competent aviation authority. Alternatively, you can also ask the embassy in your country for further information about the regulations. Please leave us a comment when you receive news and/or gain experience with your copter in Ecuador! Very interesting info. We’re traveling to Ecuador in Feb with a Mavic Air. Where might we source the liability insurance from? It depends on the country you live in. Where do you come from? Hello, I’m planning to take my Mavic pro to Ecuador. Just for recreational purpose. Is there a way we don’t need to pay for the taxes. Of course, you can hope that the customs officers will not detect your drone at the airport or ignore it. A few readers reported that they did not have to pay the tax. But I cannot guarantee that you are among the lucky guys. I am sorry!